Just kidding, they don’t even know I’m alive. And as soon as the restraining order is lifted, I’m gonna hit up their managing editor again. Hi everybody, I’m Megan Krause, and I’m the managing editor at ClearVoice. We are a complete content marketing platform headquartered in sunny Phoenix, Arizona. We’re going to answer your burning grammar and writing questions twice a month. If you want to ask me something or make a comment, go ahead and start typing in the Say Anything box. Until all your questions start coming in, let’s take a look at some of the issues that cross my desk most frequently. 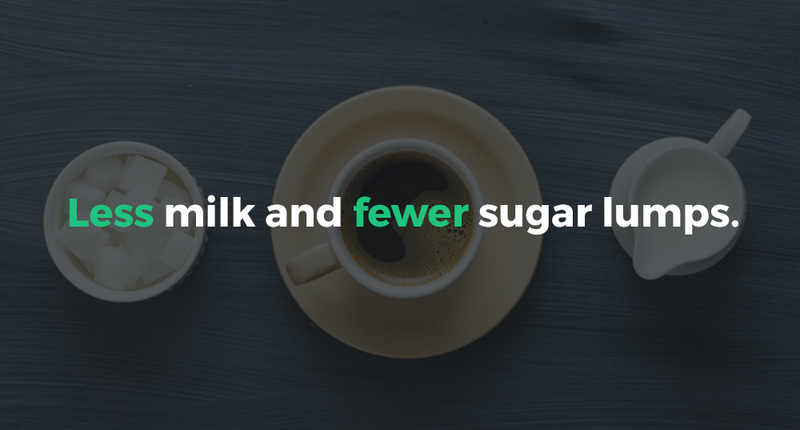 The easy way to remember this is that “fewer” is for things you can count. I have fewer candy bars. I have fewer books. I have fewer friends. “Less” and “less than” are for singular nouns that refer to big concepts, but you can’t count them individually. I have less time. I have less heart. I have less money. You have fewer dollars, because you can count dollars, but you have less money. Of course, this does bring up the whole supermarket checkout question. Is “10 Items or Less” incorrect? Technically, yes, that’s incorrect. Every Safeway and Fry’s across this great nation is doing it wrong. Here’s the thing, though — at what point do we say that the way people use language, what we call “common usage,” changes the rules of grammar? Shouldn’t the rules be fluid? Shouldn’t the people decide how language works and what the rules are? We do… I just don’t think we’re there with the less vs. fewer one yet. They all end with a preposition, and they’re all fine. How on earth would you reword those and still sound natural? I don’t know how you’d do it. Again, do it the way that people commonly speak. Ending a sentence with a preposition is fine. The Oxford comma. Let’s take a deep breath. The next issue I’m going to address is a pretty serious one, people. It’s the Oxford comma. The Oxford comma is also known as the serial comma, because you find it when items are in a series. It’s that last comma before the word “and.” I like planes, trains, and automobiles. That last comma, right before “and,” is the Oxford comma. People, it is a pock. It is a blight. It is a blemish on all humanity. OK? No Oxford comma. 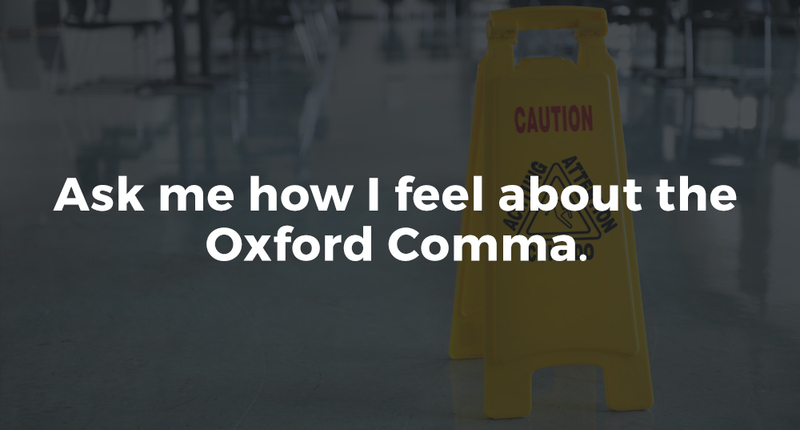 It’s called the Oxford comma because Oxford University Press first had it in place several centuries ago. Interestingly enough, even Oxford University Press no longer uses the Oxford comma. That’s called irony. Associated Press, the style gods for standard American journalism, don’t believe in the Oxford comma either. I’ll give you one caveat. If you need that comma to dispense with ambiguity, if you need it to clarify the meaning of your sentence, by all means use it. I’m in favor of the Oxford comma under these circumstances. But for a general series — I need to buy apples, oranges and pears — don’t use it. 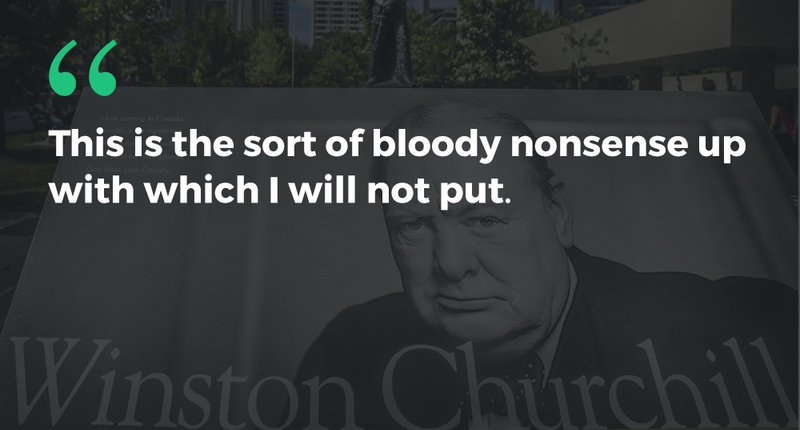 It’s ugly, and it’s just not necessary. You know, I could do a tip on this every month, every week, every day. Maybe one day I will. 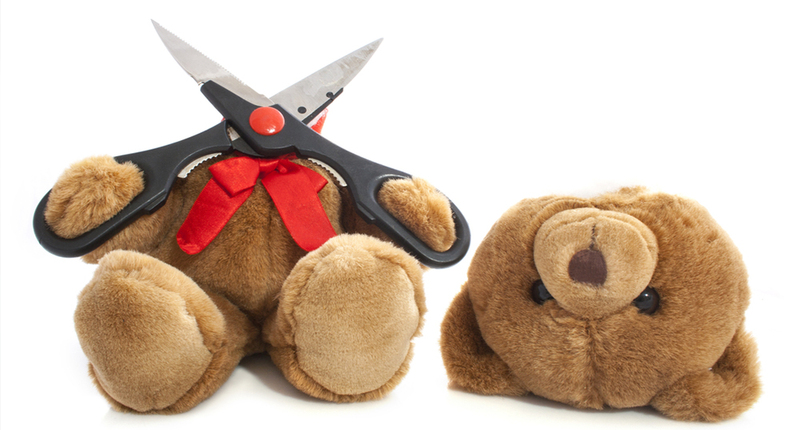 The first one I’m going to focus on for today, though, is this: Eliminate your fluff. These are the words that don’t add any value to your copy. If you cut them from your writing, the sentence still maintains its original meaning. I’m a big lover of and believer in word economy. When you’re finished with your piece, before you submit it, read over your work. If you can cut words without changing the meaning of a sentence, cut them. Word economy. The biggest offenders in this category are the qualifiers: Really, very, so, basically. Adverbs too — what did Stephen King say? He said, “The road to hell is paved with adverbs,” and I totally believe him. Cut those qualifiers. “It was very cold” becomes, “It was cold.” Bam. Much better. If it really is very cold and you’re trying to communicate that, then choose a better word. It was freezing. It was frigid. You don’t want to say, “I was very scared,” you want to say, “I was terrified. I was petrified.” You might need to choose a better word. Get rid of those dang qualifiers. “Good” is an adjective, and you use it to describe things. That was a good book. That was a good movie. She’s a good person. “Well” is an adverb. You use it to describe a verb. He ran well. He speaks well. He works well. You hear a lot of politicians saying, “We need good-paying jobs in this country.” No, we don’t; we need well–paying jobs in this country. Well modifies pay. So when people ask you, “Dear Megan, how are you doing?”, is it correct to say you’re good or well? I usually say I’m doing well. How I’m doing describes how I am. My verb is am. But, a lot of people say they’re “good,” and there’s even a camp that believes both are equally valid. Dear Megan, this was fantastic. When can I watch you live? Thanks! The next Dear Megan on Periscope is May 17 at 1 p.m. PDT. Here’s how to watch/participate: Download Periscope and follow ClearVoice. You can also watch via ClearVoice on Twitter. If you have any grammar or writing questions, you can tweet them to @ClearVoice and use #DearMegan.